Experience stunning views and the most sensational sunsets at Church Bay Estate. The pool cabana has been equipped for overflow guests, teenagers or staff with a bunk bed and bathroom. The gorgeous home comes fully equipped with Sky TV, WiFi, sound system, BBQ and outdoor furniture. Tropical flowers and Olive trees create a calming backdrop to the Estates pool and hot tub (no jets) area, which is well lit for night swimming. With the convenience of the perfect location you are within a mere 5-minute radius of Oneroa Village, the beach, Cable Bay Vineyard and The Mudbrick. We offer outstanding accommodation! Whether it be for your family visit to Waiheke, your corporate off site retreat, or for that special wedding accommodation, we have the solution, and I would love you to be my guest. 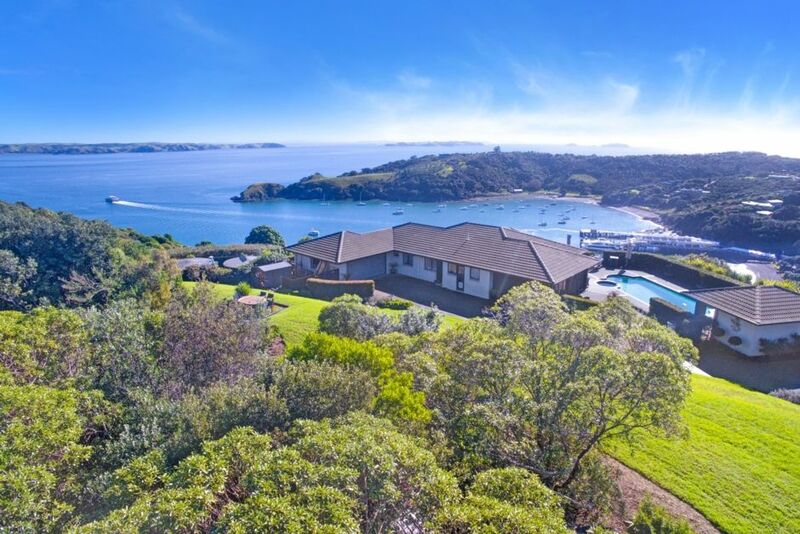 Waiheke Unlimited, has been in business on Waiheke Island for over 20 years, and our exclusive portfolio are properties which I have personally selected and priced according to what I would be happy to pay. They are located in Oneroa, Palm Beach and Onetangi, and offer the best Waiheke holiday homes within their categories of Luxury Estates, Premium Holiday Houses, Quintessential Kiwi Cottages and our 1, 2 and 3 bedroom Palm Beach Villas. Fabulous views, peace and tranquility all set in a lovely comfortable setting. Waiheke Island is full of wonderful wineries, great restaurants, adventure activities as well as leisure activities. With Waiheke Unlimited partnering with numerous providers on the Island, we can arrange everything for you; from Chefs to wine tours, in-house yoga sessions and massages, housekeeping and baby sitters or even an in-house experience to create your own Gin or signature cocktails. Waiheke Unlimited can arrange everything for you or alternatively you are welcome to book yourself, just make sure you see our Top Picks first. Book your stay with us and we will forward you some wonderful ideas as well as any promotions we are currently running.